Carlsen leads in Shamkir with 2.5/3. | Photo: Shamkir Chess. After three rounds, Magnus Carlsen is the sole leader at the Gashimov Memorial in Shamkir, Azerbaijan. Today the world champion beat David Navara, who put up a great fight. Vishy Anand was lost, but won anyway against Shakhriyar Mamedyarov who spoiled everything in time trouble. In a brief interview for the BBC, Chess.com's Roland Walker, who works in our anti-cheating department, today commented on the question of whether Magnus Carlsen is a stronger player than Bobby Fischer. Referring to Chess.com's statistical analysis CAPS, Walker not only answered affirmatively, but actually claimed that Carlsen is the most accurate player that ever lived (and that he is still getting stronger!). With his win against Navara, Carlsen now has an unbeaten streak of 44 games, which is more than ever in his career. Still sticking to the Sveshnikov, the Norwegian grandmaster was prepared for Navara's 12.Kh1 (a deviation from one of the Caruana-Carlsen match games) and quickly played a new move himself. Navara came up with the same Ra1-a3 maneuver as Giri yesterday, but then miscalculated and put it on the wrong square. It went 18...g5! 19.Rxe7 gxf4 and here Navara had forgotten that the rook has no way back. He was forced to sacrifice an exchange. In the remainder, the Czech GM defended strongly and it was by no means easy for Carlsen to convert. One Norwegian chess fan pointed out exactly how close it was. The chess lover that he is, Navara insisted in showing some very nice variations in the endgame at the press conference. Don't miss the annotations where 46...h5 is mentioned, as both Carlsen and Navara's analysis and an improvement by the engine are quite pretty. Carlsen and Navara were enjoying their endgame analysis. | Photo: Shamkir Chess. Although he scored his first win in the tournament, Vishy Anand hasn't found his top form just yet. 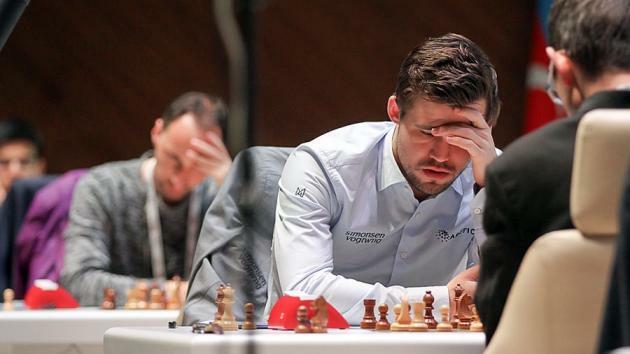 He was actually lost against Shakhriyar Mamedyarov, who spoilt everything in time trouble and continuously shook his head as he realized what he had done. Here 35...N6h5 would more or less paralyze White, and the plan of ...Qd6-e6-e3 is very hard to meet. Instead, 35...Ne4? looked strong as well but 36.Bxe4 dxe4 37.Ne5 Nd3 White had 38.Qh8+! It's a beautiful and known idea. Anand himself also got to play it against Peter Leko at the 2009 Amber tournament. There it was a blindfold game, so surely he would see it today! As so often (and as this author numerously experienced himself), the shock of completely missing something quickly produced another error. After 38...Kxh8 39. Nxf7+ Mamedyarov quickly went 39...Kh7?! (39...Kg7 avoids more forks) 40. Nxd6 Bd7? ...missing 41. Nxe4! and White won another pawn. "This position is just lost. It's just completely busted. I am playing for the only trap; I just got lucky with this one trick," acknowledged Anand. Mamedyarov blamed lack of time to think clearly, and said: "As a professional grandmaster I should accept this result as a normal result." Annotations by GM Dejan Bojkov will be added soon. With some luck Anand avoided a disastrous start. | Photo: Shamkir Chess. Teimour Radjabov was again involved in the game that finished first. He played the white side of a Marshall Ruy Lopez, had nothing to add to current opening theory and so his draw with Ding Liren in just 1.5 hours was not a surprise. The Azerbaijani grandmaster said that theory ended with 27.f3, but apparently he had forgotten about his clash with Levon Aronian from 2005 where the Armenian GM also played 27...Re2 ("best move according the engine" - Radjabov). Ding said he knew that rook move, how but "had to find some details." He spent quite some time on the clock as it was still "kind of tricky for Black," as Radjabov put it. Radjabov, and nobody else, has refuted the Marshall yet. | Photo: Shamkir Chess. Shortly after, Alexander Grischuk and Anish Giri occupied the press room. Despite (or perhaps because of) a sharp opening setup by the Russian grandmaster, the players started repeating moves before move 20. "It's actually quite funny. You have to have a certain level of chess qualification as a chess amateur to separate games that have no value at all and games that are actually interesting. For example, Teimour has played the same game against Aronian twice already, while Alexander at least found this new idea." Grischuk-Giri, brief but "cool" game. | Photo: Shamkir Chess. It's true that an early g2-g4 thrust in a Queen's Pawn opening that hasn't been played before is more exciting that seeing that Marshall endgame again. At the same time, it feels that move 17 is a bit early for a repetition. Grischuk said that he was caught a little bit by surprise by 10...cxd4 11.cxd4 dxc4, whereas Giri argued in classical fashion that it's logical to open the center as an answer to a flank attack. And then, both players suddenly felt they would take too much risk if they'd play on. A typical pose for Giri, in deep concentration. | Photo: Shamkir Chess. The players gave some interesting answers about social media. Grischuk: "I can imagine I will have some Twitter or something but in general I don't like it. Nowadays you're somewhere and immediately someone will make photo with you, put it on Instagram, everyone knows where you are, what you are doing... I just absolutely hate it. "In general, there are many few things in the modern world that I like. It's nice that we have electronic tickets, to have GPS when you're driving, of course there are some very nice things but in general the way in which the world is going I dislike." And then he added, paraphrasing Groucho Marx: "You can say it's a principle for me but if you pay me enough I will have another principle!" Grischuk: "If you pay me enough I will have another principle!" | Photo: Shamkir Chess. Giri, who is very active on Twitter these days: "In my case, I also use it for taking off some stress because I don't smoke, I don't drink... Sometimes I only look at chess all the time and sometimes I get very tense and in a lot of pressure on me, I am non-stop looking and preparing and thinking about my opponents and for me it's a way of relaxation. I read it, I write there something and some people are writing some nasty messages; it makes me smile. For me it's a way of mostly relaxing." Giri uses Twitter to relax. | Photo: Shamkir Chess. Although it took them a bit longer, Sergey Karjakin and Veselin Topalov reached the same conclusion on move 32. Their position was double-edged and neither one of them wanted to risk a loss by continuing the game. It looks like Topalov made an excellent judgement early in the game, where he felt that his two knights were quite strong, and excellent counterparts to White's bishop pair. Who else wonders if Topalov is a Prince fan? | Photo: Shamkir Chess. Topalov said that he is mostly "enjoying life" these days, but that he will be playing more this year. He signed up for the FIDE Grand Prix series because he likes the fact that they're now knockout tournaments. His first one will be the GP in Jurmala/Riga in July. "It's good because with the first one it's summer. If I lose I just go to the beach! I already reserved the hotel." The Bulgarian is mostly "enjoying life" these days but at least we'll see him in the Ivory Coast leg of the Grand Chess Tour and then the Grand Prix. He said he doesn't expect much from the latter because he's lacking rapid skills. | Photo: Shamkir Chess.